Three Indian warships sailed into Fremantle to participate in a week-long naval exercise off the Western Australian coast. Exercise Australia India (AUSINDEX) is a regular bilateral maritime exercise aimed at developing a deeper understanding and cooperation between the two navies. 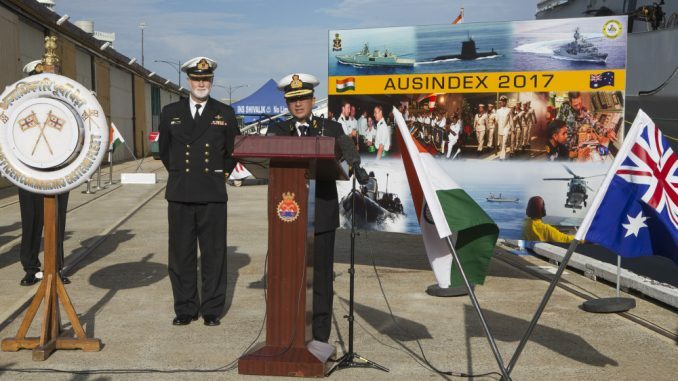 Commander Australian Fleet, Rear Admiral Stuart Mayer, said AUSINDEX 17 was a concrete example of India and Australia working more closely together to increase maritime security. “Australian and India share a commitment to a stable and prosperous Indian Ocean region,” Rear Admiral Mayer said. “Amidst a very busy operational program for the Indian Navy, I am pleased to welcome their ships to Fremantle and look forward to a challenging and rewarding sea program. “AUSINDEX is the centrepiece naval exercise held between Australia and India and is an important component of this year’s fleet program,” Rear Admiral Mayer said. The exercise will integrate Indian Navy Ships Shivalik, Jyoti and Kamorta into Royal Australian Navy operations of increasing complexity. The Royal Australian Navy is represented by HMA Ships Newcastle, Waller and Clearance Diving Team Four.